A model is used to combine processes and data sets to create compelling results. ArcGIS 9 is the next major release of ArcGIS. It builds on the strength of previous releases and adds important capabilities not previously offered in ArcGIS products. The focus of this release is on providing geoprocessing functionality, annotation and labeling improvements, geodatabase enhancements, 3D visualization, and new developer deployment options. Esri has made a significant effort in ensuring that existing ArcGIS applications continue to work unmodified at ArcGIS 9, making it easy for end users and developers to upgrade their systems. Esri is always committed to improving the reliability, scalability, and interoperability of the entire ArcGIS system, and ArcGIS 9 continues to make significant strides in these areas. 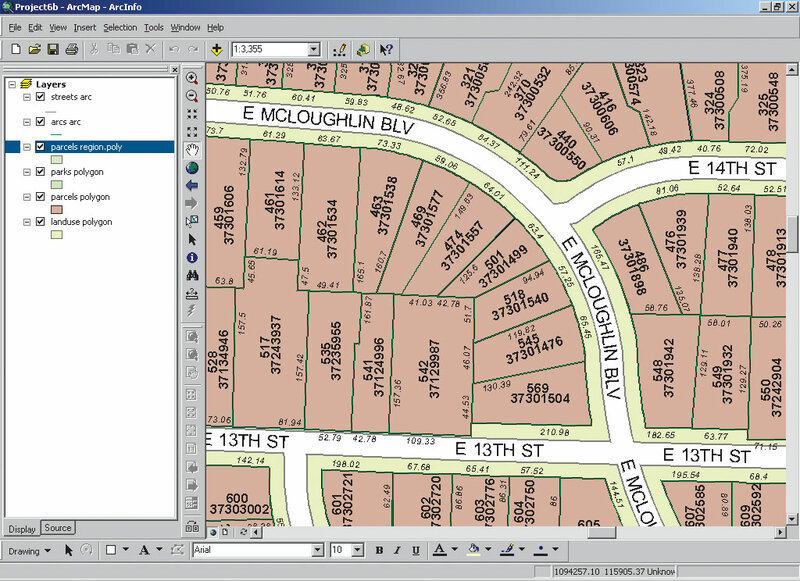 ArcGIS 9 provides a complete geoprocessing framework and set of tools for the ArcGIS Desktop products: ArcView, ArcEditor, and ArcInfo. Along with mapping and data management, geoprocessing is one of the fundamental capabilities of GIS. Geoprocessing tools range from common GIS operations, such as overlay, buffer, and data management, to more advanced operations for raster processing and topology and schema definitions. 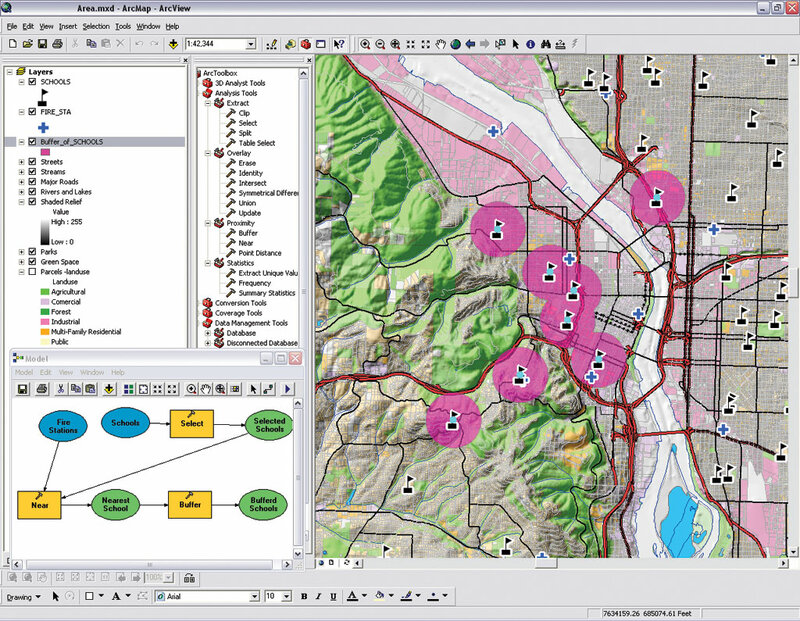 The geoprocessing framework is common for ArcView, ArcEditor, and ArcInfo, though the number of tools available within each product varies. ArcInfo provides the most robust set of tools (approximately 200), including all of the geoprocessing functionality that has been available in ArcInfo Workstation, allowing for advanced analysis and the creation of complex work flows. 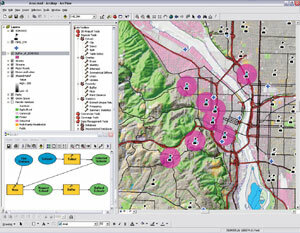 ArcView and ArcEditor provide a subset of the more common map-based analysis tools (approximately 30). More than 200 additional tools are provided via the ArcGIS extensions such as ArcGIS 3D Analyst and ArcGIS Spatial Analyst. The geoprocessing tools in ArcGIS 9 can be used in a number of ways and work with all supported data formats including geodatabase feature classes. The same operations, commands, or tools can run within dialogs, interactively in visual models, or quickly via command line input or be integrated into multipart scripts or applications for advanced analysis. Refer to the table below to learn more about each method and when each can be used. Guide users through the process of running a tool. Become familiar with a tool and its parameters. Process multiple operations on multiple data sets at once. Present methodology or work flow clearly to others. Run a tool from the user interface without using a dialog box. Provide a shortcut for the advanced user. Automate a large number of tasks. Branch tasks based on conditions. Create delayed processing of tasks. Automate tasks independent of ArcGIS Desktop. Incorporate tools and set environments into new and existing applications. Create custom dynamic link libraries that incorporate geoprocessing tools. Another major focus of ArcGIS 9 is on significantly improving the user experience when creating, editing, and managing labels and geodatabase annotation. A new set of tools enables users to centrally manage the numerous label types found in most maps. In addition, there are new tools for managing geodatabase annotation, allowing users to simply and easily update and create annotation. The geodatabase has also been upgraded to support more advanced text formatting and annotation. Advanced text placement using Maplex for ArcGIS. ArcGIS 9 includes significant enhancements to raster management, query, and visualization. The geodatabase centrally stores terabytes of raster data (e.g., air photos, scanned maps, or digital photos) that can be accessed by multiple clients simultaneously. Users have the option to mosaic large rasters into a single raster or manage rasters as a series of tiles. Tiled rasters can store attribute information, making it possible to perform spatial-based queries and selections for corridor analysis or data updates. Raster data can also be associated and stored with vector features, allowing for hot-linked rasters such as house photographs on a parcel map. In addition, overall raster display is faster and better. As part of Esri's ongoing commitment to practical interoperability, ArcGIS 9 features publication of a standard, open format for geodatabases. This takes the form of an Extensible Markup Language (XML) schema that provides access to all database types (e.g., vector, raster, and survey measurements) and constructs (e.g., domains, rules, and topologies). By providing a way to exchange geodatabase information, users can publish data models and share geodatabase data sets in a completely open and interoperable environment. Esri introduces Maplex for ArcGIS, an automated high-quality cartographic text placement and labeling extension for ArcView, ArcEditor, and ArcInfo. Maplex for ArcGIS uses the proven Maplex text placement engine to produce high-quality cartographic automated labeling for digital and hard-copy maps. Its advanced settings for text placement include placement priority, text formatting, and conflict resolution. 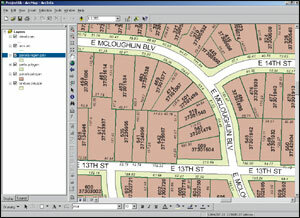 Maplex for ArcGIS greatly reduces map production time and enhances cartographic quality. The ArcGIS 3D Analyst extension to ArcGIS 9 adds two important capabilities to the 3D visualization of GIS data. First, it introduces a revolutionary technology that enables users to manage and visualize, from a local or global perspective, extremely large sets of 3D geographic data. These capabilities are available as part of ArcGIS 3D Analyst at ArcGIS 9 in a new desktop application called ArcGlobe. ArcGlobe provides the capability to seamlessly interact with any geographic information (e.g., raster, vector, terrain) as data layers on a 3D globe. Second, ArcGIS 3D Analyst introduces the ability to display 3D symbols (e.g., cars, signposts, and houses) and models with photo textures. True 3D symbology allows for a more realistic representation of features. ArcGIS 3D Analyst includes more than 500 3D symbols. Additional 3D symbols can also be imported from standard formats. 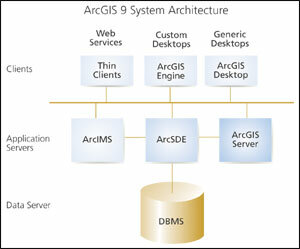 ArcGIS 9 provides a complete system for GIS application development. Esri offers developers enormous flexibility in selecting a development platform for ArcGIS. ArcObjects is at the core of these choices, offering an integrated collection of GIS software objects written in C++. Developers can choose from three deployment options (Desktop, Engine, and Server) and four development environments (Java, .NET, C++, and Component Object Model [COM]). Until now, developers have only been able to customize the ArcGIS Desktop applications. 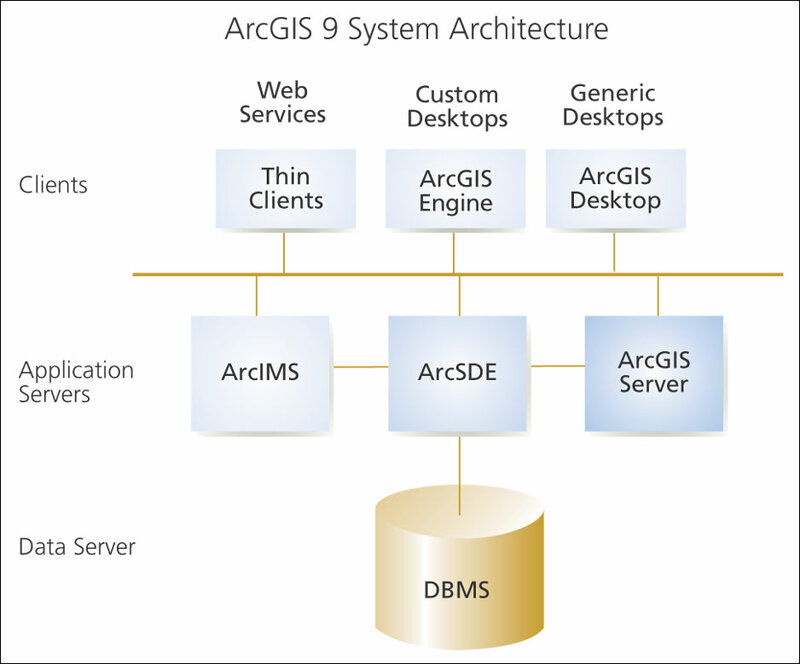 At ArcGIS 9, with the introduction of ArcGIS Engine and ArcGIS Server, developers also have the ability to deploy ArcGIS solutions as independent applications on the desktop or as Web services across the Intranet or Internet. ArcGIS Engine is a powerful collection of embeddable mapping and GIS components for creating and deploying custom GIS and mapping desktop applications. Developers can create new applications or add dynamic mapping and GIS capabilities to existing applications. Solutions created using ArcGIS Engine can vary from simple map viewers to more sophisticated GIS applications for integrated data visualization, analysis, and management. ArcGIS Engine supports all the standard development environments including .NET, COM, Java, and C++. ArcGIS Server is a GIS enterprise application server that provides complete GIS capabilities throughout an organization while maintaining a centrally managed database. Mapping, geocoding, spatial queries, editing, tracing, and linear referencing are all examples of applications that developers can build using ArcGIS Server. These applications can be consumed by browser-based clients, custom applications built with ArcGIS Engine, and ArcGIS Desktop. ArcGIS Server will support all common development environments (Java, .NET, C++, COM) and all major server platforms. The initial release of ArcGIS 9 will support Microsoft Windows while other platforms will be supported at subsequent releases. For more information on ArcGIS, visit www.esri.com/arcgis9, call Esri at 1-800-447-9778, call your Esri regional office, or contact your local reseller. Outside the United States, contact your local Esri distributor.